As we all share this life together; realization that it is all at such a splendid time to be alive with all that’s available to us in our era. Life is quite easy for many here In our towns and while we make headway to fulfill our dreams, working diligently together with expectations and ambitions for an accomplished career and home life or perhaps instead beginning the enjoyment and relaxing stages of a well-designed retirement experience, we must connect with others and be ever present and engaged in our interactions. You never know what gift of interest or insight we may receive or offer. As gifts are yours to present, it is in “what your gift comes to mean” that holds greatest measurement of intimate meaning and value. Thank you for involving us here at Gordons in consulting with you in the selection of your beautiful new gift and allowing us to help you at this inaugural launch into exactly what your new gift’s meaning will come to hold. We here at Gordons having four goldsmith benches to further care for many precious items and have held rings in hand that envelope a heritage of a grandparent’s love and now an heirloom entrusted to your care. We have held in our hands that ring enriched with longing remembrance of a loving spouse. These items didn’t begin the journey with these intrinsic values... these sentiments were added, and we treat those items with even more respect and understanding. In reflecting on the meaning of an old saying to look at a “glass half full rather than half empty “ May I add that the glass is truly both half empty and it is half full so let’s drink to it all to then refill until it overflows and share with others! We honor time for us to receive and also time for us to give and most of these are at the same moment. Recognizing that in life’s insurmountable goal to find meaning in arenas of our individual lives, it is just as special to be reciprocity’s islands in a vast sea with connectivity both exhibiting the giving and receiving. Be present with interactions receiving the joy and wonder that can equal that joy of giving. Be life’s greatest gift. Be the present that adds value to an item. Why does Gordons Gold Jewellers sell the most diamonds? The answer begins to take shape through the conversations with our distinguished clients and the many choices which offer plentiful diamond shapes to help reflect their beloved’s persona! Our greatest reward is the appreciation through which our esteemed clients express and share their experience with friends and family who compliment them on the beauty and quality of their sparkling gifts. The Oval cut is intriguing for those who love elongated and soft curves while the Square is for those who intrinsically appreciate defined edges! Variations on the Square include: Hearts on Fire ® “Dream” diamond which is cut to reveal the beautiful scintillating display of prismatic light. The eccentric Marquise cut is appealing to many with its greatest length to width ratios; it is slender with a poignant direction. Pear shape with the warm rounded beauty at one side evolving into a point. Ideal for the bride that wants a unique look. Another emotional shape is the FireMark ® “Fire Cushion” featuring softened corners as a comforting pillow, but without foregoing outstanding brilliance! Also to be considered, the awe-inspiring shape of the classic Emerald cut; this cut is sophisticated and favoured by others. These diamond variations lead up to the most popular shape, that being the classic and sophisticated Round Brilliant cut Diamond. Hearts On Fire ® has perfected the process, cutting to superlative perfection in cut. Made by Master Diamond cutters to perform and reveal seriously bright light! Earning the distinguished designation of “The World’s Most Perfectly Cut Diamond” ® this diamond is extraordinary! Cut for superb beauty, The Hearts On Fire ® diamond returns scintillating fire and brilliance noticeable to all. When you’re selecting the perfect gift this season, we welcome you to reflect on the shape of your gift of love. A Gordons Golden Key Initiative - “The Last Straw”. Key to success here at Gordons are a few important parts: Highly sought after Brands that people desire in celebrating life’s special occasions; amazing local customers and client’s whom travel from distances such as Kincardine, Toronto and Montreal; our helpful and knowledgeable staff; and community involvements all cohesively share in our success story here at Gordons. Serving London Region for over 35 years! Gordons Gold takes a great honour in helping many community initiatives lending support to the many varied events in London areas. From the “Country Classics” which raises awareness and provides funds benefiting mental health, to supporting ongoing research investments for the London Health Foundation in its endeavours towards finding a cures for Alzheimer’s, Breast Cancer and other serious or rare conditions. The Children’s Hospital along with Junior Achievement and Youth Opportunity Unlimited are amongst our endeared contributions and we are so honoured to continue supporting each of these every year. Watching our youth grow and foster in success and health is our greatest reward! Gordons Gold Jewellers also partakes in supporting environmental issues, our most pressing mandate is to further awareness in our daily use of plastics, namely, those plastics that presently cannot be reused or recycled and end up in our landfills or floating as huge masses in our oceans. These are ill affecting our sea life trickling right down to our dinner plates. It takes the action of one person to start making a difference. This movement is Stephen Webster’s “Last Straw”. Stephen, along with those committed to environmental responsibility has culminated into this project in response to the worlds plastic pollution problem; hailing from London, UK, this country alone uses 8.5 million straws each year, which is among the top 10 items found during beach cleanups and takes over 200 years to decompose! Gordons stands with Stephen Webster against this environmental issue with “The Last Straw”; beautifully handcrafted in Sterling Silver which is known for its antibacterial qualities, each straw will be hand engraved with the owner’s last name followed by the engraved statement ‘LAST STRAW”. Partnering with Plastic Oceans Foundation, Stephen Webster will donate 10% of all sales proceeds to support their ongoing work in preserving our oceans. Both Duane and I along with the amazing team here at Gordons, share in Stephen’s passion. We invite you to stop by and view this “Last Straw” and consider supporting. After Duane and I landed in Mexico, and made it through the hustle and bustle of the airport, we were swiftly on route to our gorgeous resort on the beaches of Riviera Maya. The combination of winding roads and traffic caused our hearts to race as our driver’s manoeuvrings repeatedly steered us clear of potential calamity. It took only a short while to arrive at our paradise destination – the first vacation that Duane and I have taken in over six years – but emotionally, it took us much longer to arrive. To start this much needed rejuvenating process, I begin by lounging on this lovely, sunny beach, knowing it is so important that we remember how to slow our pace. I think abstractly about people... places... letting my mind wander as I think about many things. The glistening and gleaming waves dance and spiral in attractive measure... their sounds gradually, hypnotically, revealing their message. The next day, at dawn’s first light, I watch the sun crest the horizon while birds greet this golden miracle. I marvel at the importance of a bird’s life, as it seems their sole purpose is to sing our sun to the sky and greet each new day with their melodies. Birdsong inevitably affects me to my core, and I am filled with elation as I reflect on what it means to have ‘purpose’. Through Gordons Gold, we remarkably serve our clients, their special celebrations and many occasions in their lives. We serve to celebrate new love. We celebrate a new life welcomed into this great big wonderful world. We celebrate a life shared. We celebrate lives coming together - engagements and anniversaries. Appreciation and hallmark occasions! We are welcomed into the very lives of the families we serve. It’s really quite noteworthy how we’re creating a tradition of celebratory service. Time goes by quickly, but Duane and I won’t let six years pass before our next vacation! As we continue Gordons Gold Jewellers 35th anniversary we welcome you to join our celebrations. Inquire about our Gordons “Golden Key – a loyalty appreciation program” and discover what your Golden Key unlocks! 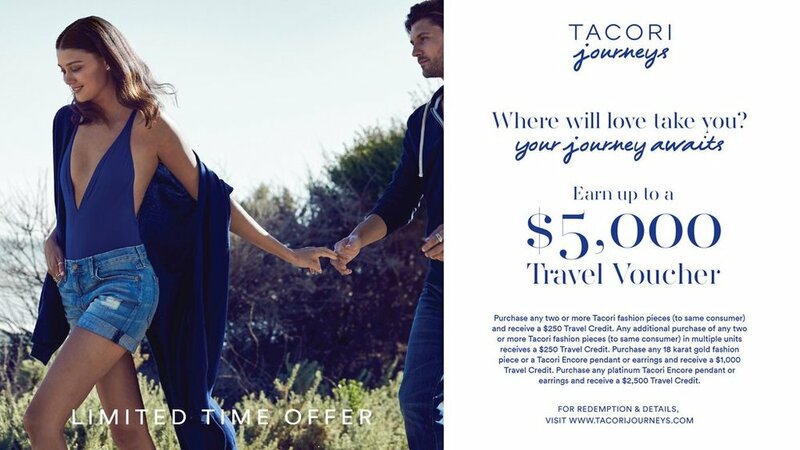 While quantities last, we will give you a $100.00 Tacori Journeys travel voucher just for trying on a piece of Tacori jewellery! Added to this gift, we will enter your name into our draw for a $5000.00 Tacori Journeys travel voucher. There is no better way to celebrate your lifetime journey than with a gift purchased at Gordons! Being part of a “best in world” success story! 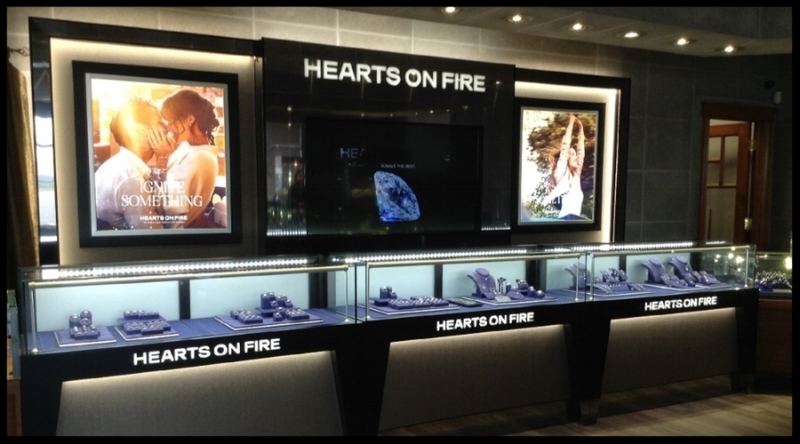 Recognizing the future potential of the Hearts On Fire Diamond and the story that accompanies it, Duane and I invested in Hearts On Fire and introduced the HOF Diamond on the counters of Gordons Gold Jewelers in 2002. Fifteen years ago this launch was a small collection of only 10 perfect diamonds for mounting in engagement rings. It was only a short while before we add Jewellery By Hearts On Fire featuring solitaire earrings and necklaces. 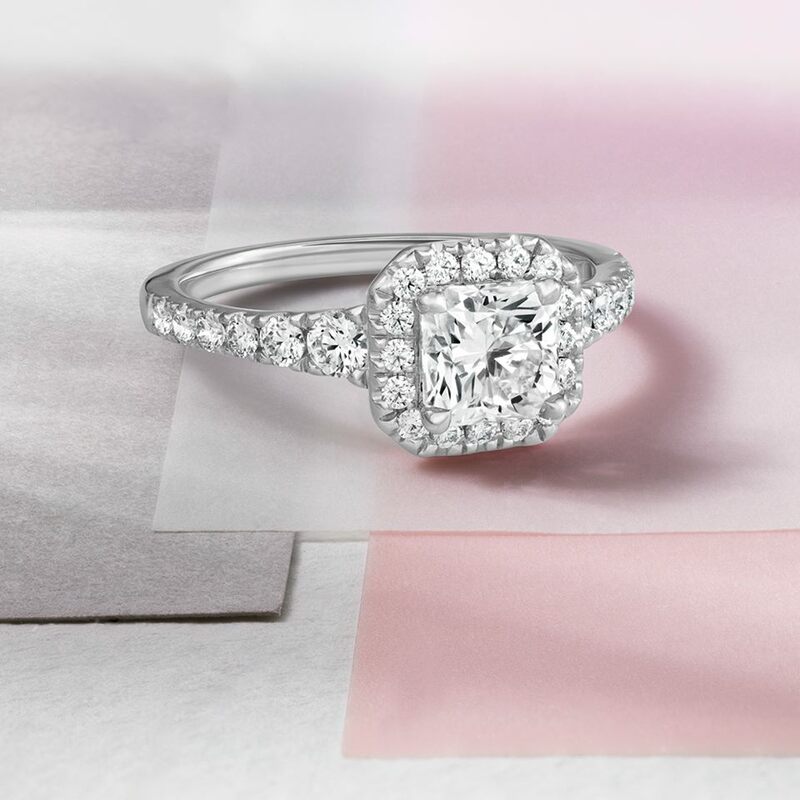 Fast forward to today, Hearts On Fire commands the largest display here at our beautiful Gordons Gold showroom and continues to boast one of the strongest engagement ring and loose diamond inventories in North America. With the most engagement rings sold, the Gordons Gold experience, combined with the HOF diamond are the perfect blends as we continue to help more engaged couples in their desire to celebrate such a time in their lives with a diamond that matches such an occasion. We love helping people celebrate love and helping our special customers celebrate their momentous occasions and there is no better way to express that love than in the scintillation of an Hearts On Fire ring. We are so honoured to be a part of this “best in world” story and thank founders Glenn and Susan Rothman every opportunity possible. Twenty-two years ago, the original founders and pioneers of Hearts On Fire, Glenn and Susan Rothman, believed that people in love would desire and reach to celebrate their special occasions with a diamond that surpassed industry standards in diamond cutting perfection-no matter the size they purchased, or what piece it was in. Now, Hearts On Fire represents that original dream in 32 countries around the world—and Duane and I thank them for believing that dream and selecting Gordons Gold Jewellers to help build the Hearts On Fire story into what it is today. Gordons Gold Jewellers is marking its 35th anniversary this year and is launching a yearlong campaign through 2018 and we are filling this year with many anniversary celebratory measures. As London and area families, and multitudes of young couples celebrate by taking part in our festivities, we are launching Gordons “Golden Key – a loyalty appreciation program”, and we invite you to come join in the celebrations. Further we welcome you to bring your own items for a complimentary inspection and we’ll treat your jewellery to a spa treatment and answer questions you may have on your heirloom items of jewellery. We conduct refurbishments on your precious heirlooms, if required, and we complete the work here in our goldsmith workshop by one of our experienced goldsmiths. One of our exciting on-going features here at Gordons Gold Jewellers is to grow your Hearts On Fire diamond earrings! We welcome you to come in to see how you can begin in a “Grow your Diamond” program or to see what new items you may like to add to your treasured collection. Please visit this month’s Blog at gordonsgold.ca and begin the year in celebrating Gordons Gold Jewellers 35th anniversary together with us! Thank you for visiting Gordons Golds February Blog! 1 bag of frozen raspberries thawed and pureed with 2 tbsp. of sugar. Pour through a fine sieve and put in squeeze bottle and refrigerated. Prepare, serve and enjoy this sweet & delicious recipe by Duane! We surround ourselves with the warmth of home here at Gordons Gold Jewellers, from our welcoming smiles to new and returning customers, to the sight of our baby grand piano as you enter the store. Allow me to share with you the story of the first time Duane invited me to meet his parents and family. It was Christmas. He had made a homemade cheesecake for my first Christmas dinner together with his family. In addition to their table filled with his mom's traditional dishes, their home was always filled with music. I vividly recall Duane's sisters playing the piano while we all joined in singing the carols. Duane's mother took me through their home, proudly showing me works of art she or Duane had completed over the years. She was an artist who loved working in oils and water colour, and she had been Duane's earliest teacher in the arts that would encompass his whole life. She taught him the effects of light on objects to be painted and what direction shadows would cast. She gave me a clay bowl Duane had made when he was a child, as she showed me his paintings and drawings - I think she had kept all her children’s creations. Duane’s parents are no longer with us, but through our traditions that they are remembered. To this day, Duane still creates a varying array of cakes for many events. Birthdays, parties, gatherings of friends at Thanksgiving and - of course - Christmas. These creative cakes are as unique as the individuals they are made for. You may know Duane often inquires with the party’s hosts what their favourite beverage or candy is, and then proceeds in creating inspired cakes around that answer, always to the amazement of the revelling guests! Of course Duane’s innate skills were inspired by life experience. He has learned from many, including a most memorable and inspiring drafting teacher, although he began under his mother’s tutelage – a mother who recognized and fostered creativity in her children. These assists honed Duane’s creative nature into the multi-national award-winning designer he is today! Duane is multifaceted, like a fine gem (I can say this, as he is my husband). From his upbringing in music, art and sports to investing his time with his many interests, Duane gains inspiration. He is inspired by events, conversations, and especially people. This, with his desire to astound, is his way of giving of himself. When he works with clients, helping them select items of jewellery, the clients always perceive he is involved and invested in what they have to say and praise how he helped them to select the perfect gift. Duane and I have much in common, and we look forward to seeing each of you this Christmas. We invite you to view many new jewellery arrivals, from Ponte Vecchio eighteen karat yellow gold, to Les Georgettes bracelets made in Paris, to carved pearls by Galetea! Please visit this month’s Blog to share your traditions with our family and to try out one of Duane’s yummy treats at www.gordonsgold.ca. 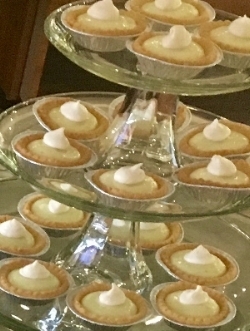 In a stand mixer, beat egg yolks and add sweetened condensed milk, (medium-for 2 minutes) add salt, zest, lime juice and mix for 2 minutes, after mixing pour filling into cooled pie shell. Chill pie for 2-3 hours before serving. Top with meringue if you wish & enjoy!! Rosanne Gardiner is the Head Buyer here at Gordons, a tremendously important position. Rosanne delivers the magic on special orders, along with researching trends and bringing only the most important finds to Gordon’s displays for our clients each season. Preparation is a key component in bringing the right products to the counter and it takes time, and brilliant foresight to be ready with just the right mix of Platinum, yellow, rose and white golds - along with gorgeous silver and fun metals for treasure and heirloom seeking clients. Platinum is the most noble of metals and highly sought after throughout generations. Currently, the choice or preference in whether to suit your style wearing yellow, rose or white gold, is highly subjective. 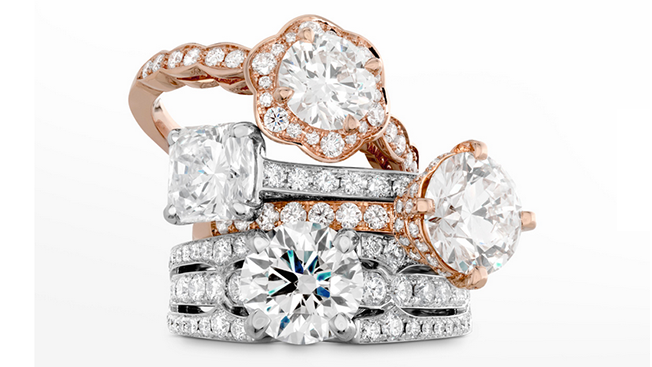 Chic and fashionable white gold collectors are now adding a rose gold layer to their repertoire. 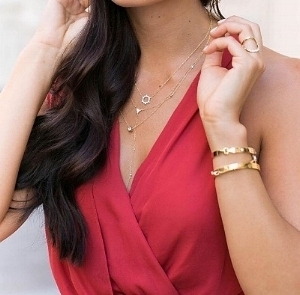 Other fashionistas are becoming fully engaged in the yellow gold revival and also mixing in a white or rose gold layer! Layering is in vogue and chic; take note of this fine gold and diamond choker necklace, paired with a draping cascade of favourites. Multipurpose items hold a position of high importance to each of us in the thought that "if I can wear it a lot, it’s worth more to me", and holds genuine intrinsic value. We invite you to revisit the classics, as classics are timeless and true at Gordons. 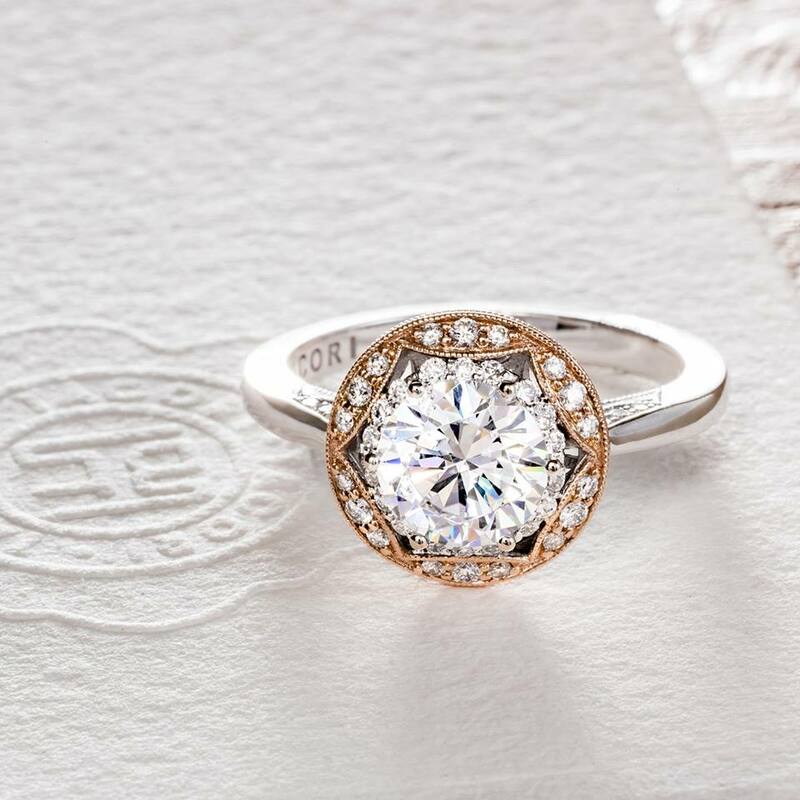 Clients walk into Gordons and ask for Tacori, a brand that delivers on bringing our Gordons’ clients a contemporary heirloom; in this, Tacori rules! Handcrafted the old fashioned way, and having the touch of forty hands, Tacori is made in California and adorns the engagement finger of many of our brides. Tacori and Gordons have a new VIP treatment for our Tacori couples, this being Tacori Journey’s; coupling travel with your Tacori purchase! Duane and Rosanne were recounting just why Gordons sells so many engagement rings here in London and why people travel distances from Montreal, Toronto, Hamilton, Stratford, Kincardine and Windsor to purchase their engagement rings with us, and summary analysis indicates it is because of the breadth of selection, price and exceptional service here at Gordons. We are so honoured and proud to be the number one destination for bridal couples and provide these couples with engagement rings they are proud to wear for the rest of their lives! Gordons has been honoured as a Hearts on Fire (HOF) Hall of Fame member, our glowing badge of pride, made possible only by our clients’ desire for this superlatively cut diamond - and they asked for it by name! We are very thankful for the loyalty of our clients and the success this has brought to our business. As you celebrate the special occasions in your life we invite you to visit Gordons! We are here to serve up the most delectable treasures in diamond jewellery! For truly edible treats visit our Gordons’ blog, where we share just how well paired good food and jewellery are for your life celebrations in this month’s issue of "From Duane's Kitchen". Written by Loretta Gordon-Bock CEO Gordons Gold Jewellers. 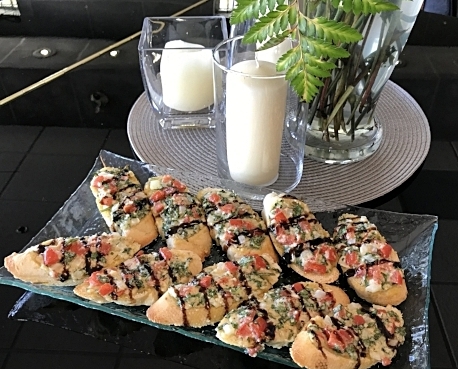 We hope you enjoy this delicious recipe by Duane! Mix the above ingredients together in a bowl. Spread this on top of a baguette or flat bread and place in the oven at 375 degree Fahrenheit. Cook for 12-15 minutes or until edges of bread start to brown. Remove from oven, cut to serving size pieces and drizzle with balsamic glaze. Plate and serve. When you enter Gordons Gold Jewellers, you will be immediately captivated by our display of birthstones. June is celebrated by both alexandrite and pearl. Rare and precious alexandrite exhibits the phenomena of colour-change. Often described by gem aficionados as “emerald by day, ruby by night,” alexandrite is the very rare colour-change variety of the mineral chrysoberyl. Originally discovered in Russia’s Ural Mountains in the 1830’s, it is now found in Sri Lanka, East Africa and Brazil. This fine material is exceptionally rare and valuable, and the level of colour-change affects its overall value. As illustrated, a single stone's change in colour can range from deep purplish-red to intoxicating bluish-green. As the second birthstone for June, the luxurious pearl is associated with wisdom and has long been a customary gift of femininity and birth - a true sign that spring has arrived! It is also a time of year when foresight is essential at Gordons Gold Jewellers. This is the point where trends and sought-after colours are set in motion, and by design are ordered for trend-ready clients and Christmas displays. It seems unusual to be enjoying lovely spring weather, while also thinking of and preparing for our clients’ gift-giving needs in December. Additionally, the spring finds Duane putting thought into what to give at Christmas from his kitchen. Every year, he plants a small garden to nurture through the spring and summer months, consisting of various basil plants, like pepper basil, purple basil, lemon basil, sweet basil and sage, along with other herbs, and his choice selections of peppers and jalapenos. Each spring, this measure of effort goes into foodie gifts for his family. Planting now, Duane knows just what he will be preparing at harvest. His hot sauce and dried rub are processed as a labour of love and thoughtfulness. Duane also visits farm roadside markets to supplement his small garden's yields, as we have a growing family of rabbits that enjoy nibbling in our garden each year. Thus, I remind Duane to plant enough for us, and the rabbits too! After daily nurturing, weeding and watering his small patch of green, Duane is fully invested in the fruits of his labour, and his resulting hot sauce and dry rubs are favourite family treats. Planning is essential - enabling Duane to harvest and clean every hot and sweet pepper, before gently placing them overnight in his smoker over wood chips of choice blends of mesquite, hickory, apple and cherry woods. After a length of time to reach the desired appeal, these smoked peppers are blended with ciders and vinegars to evolve, and then strained making use of every component. The highly-sought-after “liquid heat” is strained and bottled as Duane's hot sauce, while the valued solids are meticulously dried, ground to a fine powder and sieved to use neat or added to Duane's dry rub. Duane’s attentiveness to his garden, as well as his goldsmith bench, is incredibly prolific. This same attentiveness is shared by all dedicated Gordons team members who take great care in preparing for your gift-giving all year through! To discover some of this month’s exciting items of jewellery, and see what’s new from Duane’s Kitchen, visit our website and blog at www.gordonsgold.ca. Below this article is a mouth watering dessert to kick start your summer, something sweet from all of us here at Gordons Gold, we hope you enjoy it as much as we did ! Preheat oven to 225 F. Spray an 8 inch spring form pan with cooking spray and line the side and bottom with parchment paper and cover the outside with foil. Put chopped chocolate, butter, cream, and coffee in double boiler at medium heat. Slowly whisk together once the chocolate and butter is melted. When this is all blended together remove from heat and allow to cool. In a mixing bowl combine eggs, sugar and vanilla and beat until it almost doubles in volume. Slowly fold egg mix in cooled chocolate mix, 1/3 at a time until fully blended making sure it stays airy. Pour into spring form pan and place in the center of the oven for 2 ½ to 3 hours, test with a tooth pick to check that it’s done. Let cool at room temperature for 1 hour and refrigerate for 3 or 4 hours before serving. 1 package of fresh or frozen raspberries that have been thawed out, pour into a blender with a ¼ cup of sugar and puree, pour through a fine sieve to remove seeds transfer to a bottle and chill. May's birthstone is EMERALD! Which is a bluish green to green variety of beryl, a mineral species that includes aquamarine. Emerald 4.42ctw set with 2.15 ctw Diamond 18k white gold bracelet by Gregg Ruth. -Ireland is the Emerald Isle. -Seattle in the US State of Washington, is the Emerald city. -The colour green is known to relieve stress and eye strain. EMERALD: The first known emerald mines were in Egypt, dating from at least 330 BC into the 1700s. Gem experts differ on the degree of green that makes one stone an emerald and another stone a less-expensive green beryl. Some people in the trade tend to give the name "emerald" to any green beryl coloured by chromium. But to most gemologists, gemological laboratories, and coloured stone dealers, it is more correct to call a stone green beryl when its colour is "too light" for it to be classified as emerald. Even among that group, however, there's a difference of opinion about what's considered "too light." At Gordon's Gold we are are a part of The American Gem Society and we only consider an exact degree of green to truly be an Emerald. We have breathtaking stones from Emeralds to Alexandrites, we have something for everyone. Visit: Gemological Institute of America Inc. for more information. "Gemological Institute Of America | All About Gemstones." GIA. N.p., n.d. Web. 04 May 2017. When you're welcomed into Gordons Gold Jewellers, you will soon share a conversation with co-owner Duane Bock regarding one of his many passions – from cooking to scuba diving to jewellery creation. As an award-winning jewellery designer, and creative in The Goldsmith Shop, Duane is a driving force with his masterly-crafted items of jewellery. Among his favourite gemstones are diamond, alexandrite, and Paraiba tourmaline. He also has a passion for a family of gemstones called Corundum, which include the sapphire and ruby. Corundum varietals are sourced in many colours. While the red variety of corundum is ruby, sapphire comes in almost every colour. Corundum is mined in many places around the globe with some varieties mined only in one or two regions like the rare Padparadscha Sapphire. Duane is a great admirer of this often-reddish orange sapphire, which up until more recently was mined exclusively in Sri Lanka. Sapphire and ruby vary in value and as with all gemstones - colour is paramount! The quality of cut and clarity also play important roles in establishing the value of corundum as well as carat weight and market demand. Exquisite specimens of corundum are available in a range to suit many tastes and budgets. In light of valuation and full disclosure, the industry offers a number of industry accepted treatments to help enhance a stone’s appearance; although an untreated sapphire is still preferred. With its plethora of colours, natural sapphire is highly prized and sought after. Duane advises that lab-created sapphires as well as synthetics which are sold in some markets should not be seen as viable options when one desires a rare and precious gem. Corundum is an exciting accent or feature in jewellery due to its hardness. While diamonds are at the top of the list on the Mohs hardness scale, being rated at 10, corundum is rated at 9 on the scale. What hardness means to the wearer is that corundum will stand up to daily wear and endure when compared to softer gemstones. With the demand and interest in coloured gemstones on the rise, Duane has recently introduced a new brand of natural sapphires at Gordons Gold called Sorbet Sapphire™. Offering only untreated sapphires, each sapphire is considered a piece of art to be treasured and admired. Once a sapphire by Sorbet Sapphire™ is sold, it is gone forever! I invite you to come by our showroom and view these unique wonders for yourself. Gem collectors and connoisseurs compete for Duane’s time as our "Gem Visits" are sessions filled with passion and knowledge. With budding interest, children are also eager to get in on the stone collecting game. That is why each visit usually entails a mound of uncut corundum at which time Duane allows children to hand select their very own uncut stone to take home to begin their own gemstone collection. When Duane is not busy immersed in his gem visits, you will find him working on another of his passions; creating unique one of a kind jewellery pieces for his clients. Most creations are completed working alongside the client through various stages of the design process. By experiencing these steps, the client enjoys the journey almost as much as the final creation. Duane’s creativity process first begins by designing the jewellery in his mind, with the individuality of his client as inspiration. He then sketches his design onto paper and hand carves wax models the old-fashioned way. Once the creation is cast into precious metal, using the wax investment technique, Duane mounts gemstones in his one-of-a-kind designs. Duane has been the recipient of multiple Canadian national design awards. As such, many clients commission him to “create something remarkable” and are always delighted when they pick up their unique piece of jewellery. When Duane has some time away from the store, he is an adventurous traveller and an amazing foodie – two passions that go well together in inspiring his amazing creations in the kitchen. Just as Duane has a process for creating unique jewellery pieces, he is just as creative in his cooking creations. He starts with an extensive grocery list and can often be found by his friends in the aisles of the grocery store choosing those special ingredients for his dishes. Duane has an amazing ability to recreate a recipe he has enjoyed on his travels, all without following a recipe. This months we're featuring a Lamb Sirloin with Hazelnut Hollandaise Sauce, from our table to yours we hope you enjoy yet another amazing creation by Duane! Rinse off lamb and pat dry, season with salt and pepper and place into a large zip bag. Put rosemary, garlic and olive oil in food processer and puree to a paste, then pour over lamb, rubbing it over all sides. Put large zip bag with the lamb in it in the fridge for a couple of hours. Place lamb on a rack in a shallow roasting pan, insert a digital thermometer into lamb and place in a 400 degree pre-heated oven for 5 minutes, then lower temperature to 325. Prep your vegetable and potatoes or rice. You have about 20 minutes before the lamb sirloin reaches 140 degrees internal temperature. Remove from oven and tent in foil for 10 minutes. Internal temperature will rise to 145 degrees (med rare). Slice the lamb and tent in foil again until sauce is done. Place your sides on warm plates and return to warm oven. While the lamb is resting, in a double boiler at medium heat place butter, and a pinch of salt and pepper. When melted add whisked Frangelico liqueur (hazelnut liqueur) and egg yolk, then whisk continually until it thickens. (Hint: If it starts to separate add a small amount of cold water.) Remove bowl from heat. Plate lamb and drizzle sauce over the lamb and serve. We hope you ENJOY! Jacy and Duane sat down and discussed Aquamarine, which is March’s birthstone. Aquamarine is part of the Beryl family, with a Mohs’ hardness of 7.5-8. Aquamarine comes in light blue, blue, and blue-green, and is also known as water of the sea because of it sea water colours. Stop by Gordons Gold Jewellers today and see our wide variety of Aquamarine gemstones along with many other beautiful gems. This month we’re featuring delicious Mussels in a White Wine Herb Sauce! We hope you enjoy it and check back next month for another exquisite recipe by Duane. Fill sink with about 2 inches of tap water. Dump in mussels. Check for broken mussels that are open and won’t close when tapped, and discard. Put the good mussels in a bowl and place in the fridge. Use a large 8-10 quart pot. Put in butter, onion, garlic, pepper, fennel and chili. Place pot on stove at medium heat and stir for about 5-6 minutes. Add wine and raise heat to high, stir in basil and parsley. When it comes to a boil carefully pour in mussels and put on the lid. Let it cook for 8 to 10 minutes. Carefully pour mussels into large heated bowl and serve as a meal for two or as an appetizer. Don’t forget the baguette and enjoy! If you pop into Gordons Gold Jewellers, you will soon share a conversation with co-owner Duane Bock regarding one of his many passions - from cooking to scuba diving to jewellery creation. As an award-winning jewellery designer, creative in The Goldsmith Shop, Duane is a driving force with his masterly-crafted items of jewellery. Duane’s favourite gemstones include Diamond, Alexandrite, Paraiba Tourmaline and Sapphires. Most creations are completed working alongside the client through various stages of the design process. By experiencing these steps, the client enjoys the journey almost as much as the final creation. Gemstones and individual clients inspire Duane’s creativity, and his process begins by first designing the jewellery in his mind, then sketching onto paper and hand-carving wax models the old-fashioned way. Once the creation is cast into precious metal, using the wax investment technique, Duane mounts gemstones in his one-of-a-kind designs. Recognized for his work, Duane is the recipient of multiple Canadian national design awards. As such, many clients commission him to “create something remarkable” and are always delighted when they pick up their unique piece of jewellery. This trust in his creativity amazes Duane, and he feels honoured when a completed item fulfills the client’s dream! Duane is also an adventurous traveller and an amazing foodie – two passions that go well together. In fact, travels and adventures are Duane’s inspiration for the kitchen. Just as he uses a creative process for jewellery design, Duane also establishes one for his cooking creations. He starts with an extensive grocery list and is often found by his friends and clients in the aisles of grocery stores discovering new additions to the cartful of fresh fruits, vegetables, seafood and cuts of meat. Yet, Duane never follows a recipe, always creating as he alters the ingredients from a recipe, until it no longer resembles it. This month we’re featuring yummy Blackened Sea Scallops in Lemon Cream Sauce, and we hope you will enjoy making it as much as sharing it with great friends. Rinse scallops under cold water and pat dry. Sprinkle the salt, pepper and paprika on both sides of scallops and return to fridge. Prep garnishes, take core out of Roma tomato and dice, cut Cubanelle Pepper in half and remove cap, veins and seeds. Slice tube of goat cheese into 6 discs. In large skillet add butter, lemon juice, honey, garlic, white wine, tabasco, salt and pepper. Simmer on medium heat until it begins to thicken, then reduce heat to low. Grill or char cubanelle pepper then place on plates and keep warm in oven at 250C. In a skillet at medium high heat, add butter and olive oil and sear scallops 2 to 3 minutes per side. Add cream to sauce, return to medium heat and stir until it begins to thicken. Pour sauce on warm plates then place scallops and garnishes and serve. Please let us know how you enjoyed this latest creation by Duane! We have been a winner of the Best of London award two years in a row! London Free Press readers vote for their favourites in over 170 categories. Deadline is Sunday, January 24, 2016. Gordons Gold has been nominated for a Top Choice Award! Visit this link http://topchoiceawards.com/vote/ to vote for us. Search for our name in the nominee field. Voting is open until February 1st. Each year, they conduct a public survey that gives people like you the power to choose the Top Choice Award winners in your city. The survey acts like a bridge between you and the businesses and professionals you know and love, allowing you to support your favourites and giving you the opportunity to provide anonymous feedback to help their business.